Give your home a quick and convenient face-lift by working with Miracle Method of Fort Collins. You may be frustrated by a scratched countertop and chipped bathtub, but you don’t have to spend a small fortune on new fixtures. Our surface refinishing services are a quick and affordable way to change the color of your counters and make other fixtures look like new again. We have more than 30 beautiful color choices, so it will be easy for you to find the right look for your home. 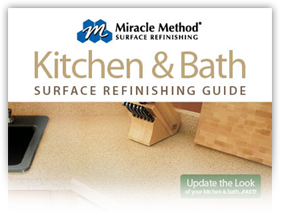 Call Miracle Method of Fort Collins and let us take care of all your surface refinishing projects. You can also visit our showroom on Red Cedar Circle.